The former Inspector General of Police Gen Edward Kale Kayihura has been charged with failing to protect war materials, failing to supervise police officers and abetting kidnap. 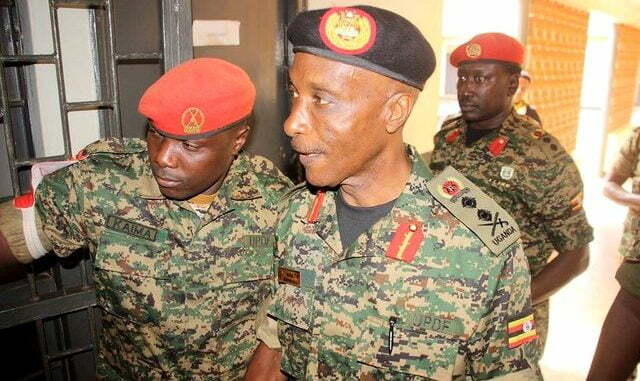 The charges were read to him before the General Court Martial in Kampala, Friday 24th morning, the first time Kayihura has appeared in public since his arrest in June. According to the statement of offence, it is alleged that between 2010 and 2018, on various occasions, Kayihura, issued guns to unauthorized persons specifically members of Boda boda 2010, a group of vigilantes headed by Abdallah Kitatta. 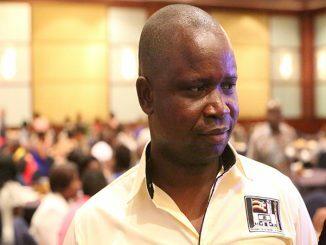 The group was on several occasions accused of disrupting opposition rallies in several parts of the country. Its patron Abdallah Kitatta has since been arrested and charged with unlawful possession of military arms and failure to protect war material. 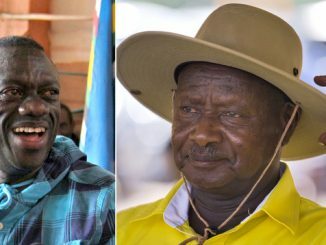 In particular, Kitatta is being tried for being I possession of a gold coated pistol and an AK47 riffle with Uganda Police Force registration details. On the second count, Court heard that during his tenure as the Inspector General of Police, Kale Kayihura failed to supervise and ensure accountability for the arms and ammunition issued to specialized units under the office of the IGP. The units include Flying Squad, Crime Intelligence and Special Operations Unit and the Witness Protection Unit. Court also heard that by commission and omission, Kayihura aided and abetted the actions of subordinate police officers to kidnap and illegally repatriate Rwandan exiles, refugees and Ugandan citizens to Rwanda. The same Charge had also been placed against a number of other senior police officers who were arraigned before the General Court Martial in 2017. Those arrested and charged earlier for the same offense, include the former Commandant of Police Professional Standards Unit, Senior Commissioner of Police Joel Aguma; Senior Superintendent of Police Nixon Agasirwe, who is a former commander of Police Special Operations and Assistant Superintendent of Police James Magada (Crime Intelligence). The three senior officers were charged together with Flying Squad operatives Abel Tumukunde and Faisal Katende as well as civilians; Amon Kwarisima, Rene Rutagungira, a Rwandese national, and Bahati Mugenga Irunga, a Congolese national. It is alleged that on September 25, 2013, the accused persons kidnapped Lieutenant Joel Mutabazi, a former bodyguard of Rwandan President Paul Kagame, in Kamengo on Kampala – Masaka road and forcefully conveyed him to Rwanda. 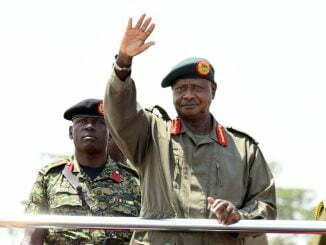 Mutabazi was later arraigned in the Military court, accused of terrorism, setting up an armed group, spreading rumors with the intention of inciting the public to rise up against the state, murder, crimes against the state, illegal possession of a firearm and deserting the military. He has since been sentenced to life in prison and stripped of his military ranks by the Military High court in Rwanda. Kayihura is now being charged with aiding and abetting the kidnap and repatriation of Joel Mutabazi as well as two other people identified as Jackson Kalema alias Ndiga and Sargent Innocent Karisa. Kayihura was represented by a team of seven lawyers from Kampala Associated Advocates who included former Solicitor General Peter Kabatsi, Dr Elly Karuhanga, Dr Karu Karumiya, Joseph Matsiko, Elison Karuhanga, Jet Tumwebaze and Capt Charles Sekenta. Kayihura denied all the three charges. He has been remanded until September 4 pending hearing of a bail application submitted by his lawyers today.